Home Who are we? Biological Scienstists James J. Peterson, R.N., Ph.D.
Dr. Peterson has pursued questions at the interface of basic science and applied technology and medicine. In 1999, he earned a Ph.D. from the University of California, Davis, in the field of cancer therapy studying the fate and clearance of radio-labeled therapeutic bioconjugates from the circulation. As the tools of genetics and molecular biology exploded, he was privileged to work with Dr. Clay Smith in the University of Florida’s Department of Ophthalmology using cloned constructs (e.g. fluorescent fusion proteins) to address persistent limitations of immunohistochemistry. These and other molecular-genetic techniques were applied to controversies concerning the light driven translocation of the visual signal transduction protein, arrestin, in photoreceptors. With Dr. Larry Takemoto, in the biology department at Kansas State University, Dr. Peterson published reports in another part of the eye, answering questions of lens crystallin protein interactions using novel informatics (MS3D), mass spectrometry, and surface plasmon resonance. Again at the University of Florida Dept. of Ophthalmology, in partnership with Dr. William Hauswirth and Genzyme, Inc., he utilized a mouse model of retinal angiogenesis, retinopathy of prematurity (ROP), to study the application of viral therapeutics to reduce devastating ocular neovascularization that occurs in eye diseases like age-related macular degeneration (AMD) and proliferative diabetic retinopathy (PDR). With Dr. Lonnie Ingram, extensive knowledge of bio-analytical instrumentation was applied to help devise a practical, large scale conversion of plant cell-based carbohydrates into fuels and chemicals. From 2011-2013, Dr. Peterson pursued a nursing degree from Santa Fe College in Gainesville, Florida and is a licensed, registered nurse. During this training he assisted Dr. Shannon Boye, Ph.D., and vitreoretinal faculty in their pursuit of clinically applicable viral ocular therapeutics for the treatment of tragic sight-stealing genetic diseases (e.g. Leber’s congenital amaurosis (LCA) and Usher’s syndrome). 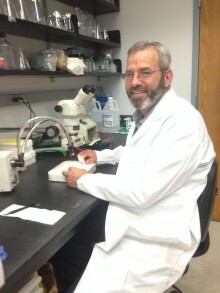 Dr. Peterson’s commitment to apply both basic and clinically relevant data to the lives of real people finds expression in many ways in the ocular gene therapy environment in the Boye lab; from acting as lab manager, totraining new personnel in bio-analytical techniques, to conducting expert and well-documented protein analysis (e.g. Western), immuno-histochemical experiments and confocal microscopy, to watching for clues and new techniques from the literature that may assist us in our pursuit of practical cures for blindness. Peterson, J.J. & Meares, C.F. (1998). Cathepsin Substrates as Cleavable Peptide Linkers in Bioconjugates, Selected from a Fluorescence Quench Combinatorial Library. Bioconjugate Chemistry ; Sept.-Oct., Vol. 9 (5), pp. 618-626. DeNardo, G.L., Kroger, L.A., Meares, C.F., Richman, C.M., Salako, Q., Shen, S., Lamborn, K.R. Peterson, J.J., Miers, L.A., Zhong, G.R. and DeNardo, S. (1998). Comparison of DOTA-Peptide-ChL6, a Novel Immunoconjugate with Catabolizable Linker, to 2IT-BAD-ChL6 in Breast Cancer Xenografts. Clinical Cancer Research; Oct. Vol. 4 (10); pp. 2483-2490. Peterson, J.J., Pak, R.H. & Meares, C.F. (1999). Total Solid Phase Synthesis of 1,4,7,10-tetraazacyclododecane-N,N’,N”,N”’-tetraacetic acid- Functionalized peptides for Radioimmunotherapy. Bioconjugate Chemistry ; Mar-Apr.,; Vol. 10 (2), pp. 316-320. Peterson, J.J. & Meares, C.F. (1999). Enzymatic Cleavage of Peptide-Linked Radiolabels from Immunoconjugates. Bioconjugate Chemistry;. July/Aug., Vol. 10 (4), pp. 553-557. DeNardo, G.L., DeNardo, S.J., Peterson, J.J., Miers, L.A., Lam, K.S., Hartmann-Siantar, C., Lamborn, K.R. (2003). Preclinical Evaluation of Cathepsin-degradable Peptide Linkers for Radioimmunoconjugates. Clin Cancer Res. 2003 Sep 1;9(10 Pt 2):3865S-72S. Peterson, J.J. Young, M.M., & Takemoto, L.J. (2004) Probing Alpha Crystallin Structure using Chemical Modifications and Mass Spectrometry. Mol. Vision Nov. Vol 10, pp. 857-866. Smith, W.C., Dinculescu, A., Peterson J. J., McDowell, J.H. (2004) The Surface of Visual Arrestin that Binds to Rhodopsin. Mol. Vision; 2004 March, Vol. 10, pp. 392-398. Scaria, A., Pechan, P., Rubin, H., Lukason, M., Barry, E., Ardinger, J., Qiu, H., Li, Q., Peterson, J., Hauswirth, W., Wadsworth, S. (2006) AAV-2 Based Gene Therapy Using Novel Anti-VEGF Molecules for Inhibition of Angiogenesis in the Eye. Molecular Therapy, 13(S1), pp S340. Peterson, J.J., Orisme, W., Fellows, J., McDowell, J.H., Schalemar, C.L., Dugger, D.L., & Smith, W.C. (2005) A Role for Cytoskeletal Elements in the Light-Driven Translocation of Proteins in Rod Photoreceptors. IOVS, November; 46(11), pp. 3988-98. Peterson, J.J., Radke, G., & Takemoto, L.J. (2005) Interaction of Lens Alpha and Gamma Crystallins During Aging of the Bovine Lens. Exp. Eye Res., Dec., 81(6) pp. 680-9. Smith, W.C., Peterson, J.J., Orisme, W., Dinculescu A. Arrestin Translocates in Rod Photoreceptors. (2006) Adv. Exp. Med. Biol. 572, 455-64. Springer Science, NY, NY. Editors Hollyfield, J.G., Anderson, R.E., Lavail, M.M. Geddes, C.C., Peterson, J.J., Roslander, C., Zacchi, G., Mullinix, M.T., Shanmugam, K.T., & Ingram, L.O. (2010) Optimizing the Saccharification of Sugar Cane Bagasse using Dilute Phosphoric Acid Followed by Fungal Cellulases. Bioresource Technology, 101(6),pp. 1851-1857. Claudia C. Geddes, James J. Peterson, Michael T. Mullinnix, Spyros A. Svoronos, K. T. Shanmugam, Lonnie O. Ingram(2010) Optimizing Cellulase Usage for Improved Mixing and Rheological Properties of Pretreated (phosphoric acid) Sugarcane Bagasse. Bioresource Technology 101(23), pp. 9128-36. Epub 2010 Jul 14.